A tiny birthday card, crafted against all odds within the confines of Auschwitz. Ten-year-old Sorale discovers a tiny heart-shaped book among her mother’s belongings. Its pages are shaped like four-petaled flowers, upon which are written words in languages Sorale does not understand. Who wrote these words? Where did the heart come from? Why has her mother never mentioned this tiny book before? 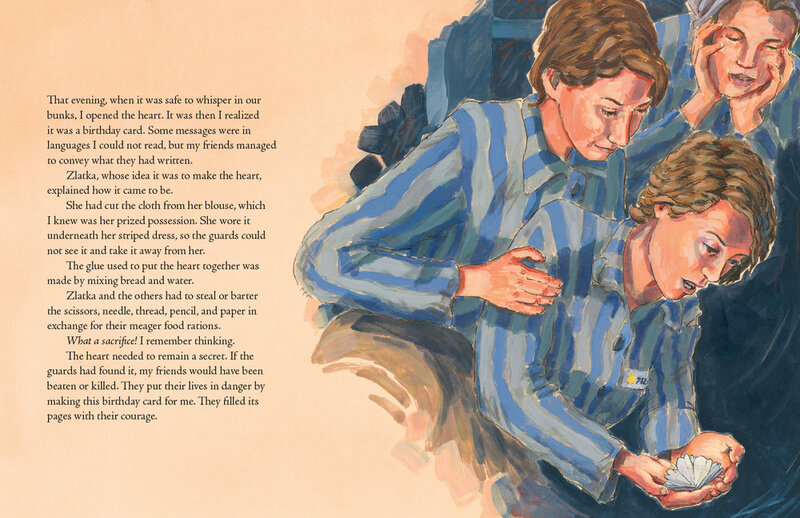 Fania’s Heart reveals the true story of the crafting of the heart, against all odds, within the confines of Auschwitz, and of the women of immeasurable resilience, courage, and loyalty who risked their lives for Sorale’s mother, their friend. Richard Rudnicki is an award-winning picture book illustrator, an author, and a painter. Most of his picture books are about subjects from Canadian history. He conducts workshops in painting, drawing, and illustration, gives illustrated talks, and takes private students. He lives in Halifax, Nova Scotia. Anne Renaud has a penchant for stories that have a historical slant. She has written on the topics of Pier 21, the Empress of Ireland, and the Canadian Tulip Festival. She has written several children’s picture books, in both English and French, including Mousseline vole au vent, Missuk’s Snow Geese, Amande Lavande, Les pierres d’Emma, and Mr. Crum’s Potato Predicament. Anne lives in Westmount, Québec.